Sam has over 40 years of diversified accounting experience in private industry and public accounting in the areas of financial management and planning, M&A, and commercial and business services. Sam’s experience in matters of corporate reorganization, insolvency, and litigation support is extensive. He has worked with numerous troubled companies in financial reorganization, creditor workouts and insolvency, and has actually managed and operated numerous businesses through the reorganization process. 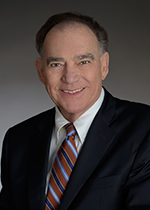 Sam received his BSBA degree in Accounting from Creighton University in 1965 and his MBA degree in Finance from the University of Wisconsin, Madison in 1968. He is a licensed Certified Public Accountant in California. Sam has an extensive background in corporate operations, M&A and reorganizations. As a former bankruptcy trustee for the Central District of California and a receiver in both the Federal District and California Superior Courts, Sam has administered thousands of insolvency cases, including actually operating troubled businesses and real estate ventures—many of which were multi-million dollar entities.